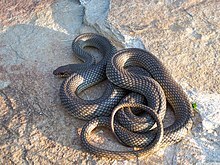 The Colubridae (frae Laitin coluber, snake) are a faimily o snakes. Wi 304 genera an 1,938 species,[citation needit] Colubridae is the lairgest snake faimily, an includes aboot twa-thirds o aw current snake species. The earliest species o the faimily date back tae the Oligocene epoch. Colubrid species are foond on every continent except Antarctica. This page wis last eeditit on 27 August 2013, at 03:34.